Jamo S 805 review | What Hi-Fi? To choose a pair of speakers based solely on its higher star rating is a dangerous game. While a five-star review indicates we think the product is a fine all-rounder, scoring highly across the board, the idea that full marks deems a product the definitive option is erroneous. There have been few better recent examples to highlight this than these Jamo S 805s. Although £350 isn’t loose change, in terms of floorstanders it’s a bit of a snip. That might be where our fondness for these speakers begins, but ultimately it’s probably the least important of the many things that go in their favour. It’s more to do with their design, and the concept of ‘lifestyle’ for once representing more than a few ornamental flourishes in lieu of sonic flair. At just under 80cm in height and enviably slim, the S805s do the best they can to make floorstanders an option for everyone, regardless of free space – just as they cater for a more modest budget. They also house a front-firing tube port for bass reinforcement, which means they can be positioned close to the back wall without sacrificing too much agility in the low end. That port really makes itself known, supporting the sound delivered by the two-way configuration of 12.5cm polyfibre woofer and 25mm soft dome tweeter. Even though these intuitive aspects of the design are worth celebrating, Jamo hasn’t ignored the importance of aesthetic. The S805s are available in three classily minimalist finishes: the white of our review sample; black, with darker walnut trimmings; walnut, with black trim. Both their price and accommodating design set the S805s apart, but it’s their performance we think will have many clamouring to take them home. To say they don’t take the music too seriously may sound like a fairly backhanded compliment, but these Jamos are a lot of fun. The S805s don’t just pack a punch, they’ve taken all the padding out of the gloves too. We play Rival Consoles’ Persona and get an immediate sense of these speakers’ drive and authority - the record feels like a drag race through a dystopian cityscape. That has much to do with how hard that reflex port is working, extending to rattling unsecured items in our testing room at higher volumes. It isn’t perhaps the most detailed of bass responses, but it digs deep and the thrill of its low-end heft does much to make up for it. We would prefer a little more body in the midrange – the S 805s appear to emphasis the frame around those middle registers formed by the bass and a lively treble that usually toes the line well between clarity and coarseness. Sympathetic system-matching is imperative here. It’s far from a trough in the balance, though, and melodies are described fully in this front-facing mix. A switch to a more orchestral work, such as Clint Mansell’s High-Rise soundtrack, highlights some of the S 805s’ mild limitations. 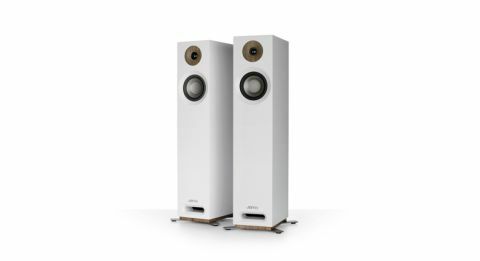 They aren’t as detailed or spacious as Fyne Audio’s F302 floorstanders (£400), nor do they handle timing or dynamics with quite the same precision - but we’re far from the point where we describe the performance as badly lacking in these regards. It suggests these are pairs of speakers for two separate audiences. To say the S 805s aren’t so concerned by a traditional hi-fi presentation, or that their talents are limited to certain genres of music, would be misleading - their emphasis is on making music fun to listen to, and they do that to a tee. It isn’t that refinement has gone out the window, just that Jamo’s main focus is elsewhere. The S 805s’ price and diminutive stature give the air of speakers designed for budget and lifestyle, but even the briefest of listens lays waste to any notion of sonic performance having been neglected. You could want more insight, more outright detail and sympathetic dynamics - we do, and for that we have Fyne Audio. But for drive and energy, you’ll struggle to find much under that magic half-a-grand price point to better these S 805s.